Doug Goodkin is most well-known for his work as a music educator and particularly as a proponent of Orff Schulwerk, a dynamic approach to music education developed by composer Carl Orff and his colleague, Gunild Keetman. This work has led him deeper into education as a means to shape the future by meeting the promise of humanity in each of its developmental phases. A career of working with preschool, elementary, middle school, college students and adults has provided insight into the special needs of each age level and the universal needs of all ages. Traveling and teaching throughout the world has helped sift out where cultures both differ and converge and inspired him to celebrate both. His four decades of work in one school has given him the opportunity to help shape a community that inspires the higher impulses of children and adults alike. Experienced teacher, perpetual student, avid reader, prolific writer, performing musician, social activist, jazz aficionado and piano player, Zen Buddhist practitioner, and world traveler, Doug's diverse work and interests are tied together by a vision of celebrating individual flowering within the circle of community. BRIEF VITAE: Doug Goodkin is currently in his 44th year at The San Francisco School, where he teaches music and movement to children between three years old and eighth grade. He regularly gives workshops for Orff Chapters throughout the U.S. and Canada, as well as presenting at State and National Conferences. He is an internationally recognized Orff Schulwerk teacher, teaching courses throughout Europe (Austria, Belgium, Canary Islands, Czech Republic, Denmark, England, Estonia, France, Finland, Germany, Norway, The Netherlands, Greece, Iceland, Italy, Poland, Portugal, Russia, Scotland, Slovenia, Spain, Sweden, Switzerland and Turkey), Asia (China, Japan, Hong Kong, Indonesia, Korea, Malaysia, Philippines, Singapore, Taiwan, Thailand, Vietnam), Australia (Sydney, Adelaide, Perth, Brisbane, Melbourne), New Zealand, Africa (South Africa,Ghana, Morocco), South America (Argentina, Brazil, Chile and Columbia). He is the director of The San Francisco Orff Certification Course and teaches his own course on Jazz and Orff Schulwerk in San Francisco and co-directs and teaches in the Orff-Afrique Course in Dzodze, Ghana. Doug received the distinguished Pro Merito Award from the Orff Foundation in Munich, Germany for his contributions to Orff Schulwerk in July, 2000 and the Distinguished Service Award from the American Orff Schulwerk Association in November, 2018. Doug is the author of eight books on music education: A Rhyme in Time, Name Games, Sound Ideas (Alfred Pub. ), Play, Sing and Dance: An Introduction to Orff Schulwerk (Schott), Now's the Time: Teaching Jazz to All Ages and Intery Mintery: Nursery Rhymes for Body, Voice and Orff Ensemble (Pentatonic Press), The ABCs of Education: A Primer for Schools to Come (Pentatonic Press) and his recently published All Bues: Jazz for the Orff Ensemble. He is an author of the Macmillan/McGraw -Hill textbook series Share the Music and a contributing author in various collections: Many Seeds, Different Flowers (De Quadros; Cirme), Creativity in Music Education (Sullivan/ Willingham, C.M.E.A. ), Music of the World's Cultures (ISME). Doug has written numerous articles on Orff Schulwerk in contemporary culture, published in the Music Educators Journal, Orff Echo, The Ostinato (Canada), Informationen (Austria), New South Wales Bulletin (Australia) and The Orff Times (England). He started the jazz band Doug Goodkin & the Pentatonics in 2011 with the mission of bringing jazz to families and children of all ages. They have performed at the Stanford Jazz Festival, San Francisco Jazz Center and at various schools in the Bay Area and produced their first CD, Boom Chick a Boom: Jazz for All Ages. 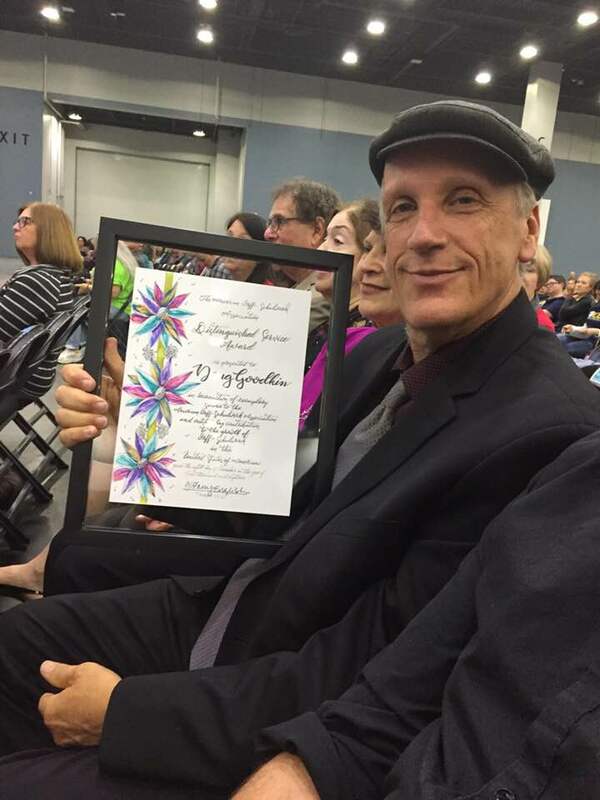 Doug is particularly known for his innovative application of Orff Schulwerk to the teaching of jazz and multi-cultural music and his ideas connecting Orff Schulwerk to the greater world of education, culture and human potential.